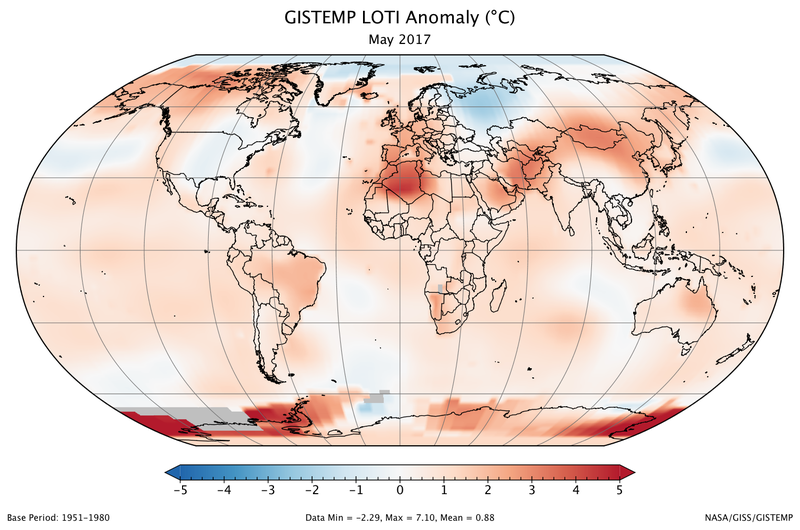 A global map of the May 2017 LOTI (land-ocean temperature index) anomaly shows that the extreme warmth that affected parts of the northern hemisphere — Siberia in particular — in prior months has partially abated. View larger image. 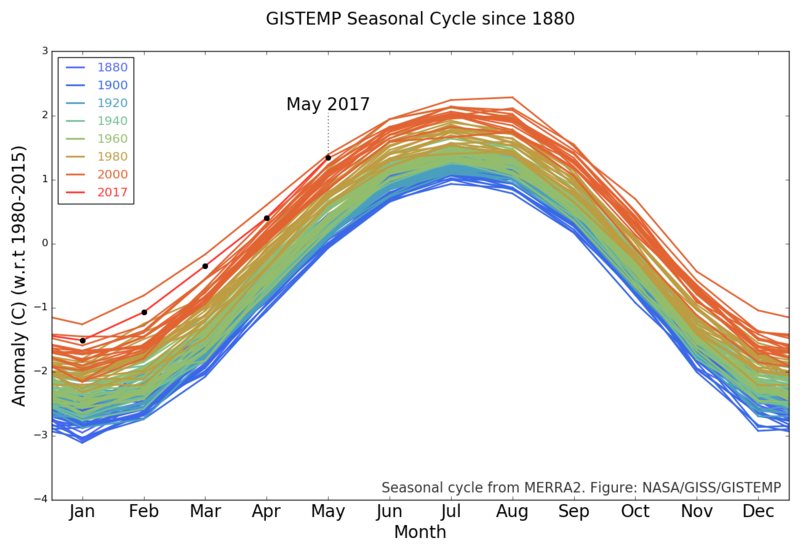 May 2017 was the second-warmest May in 137 years of modern record-keeping, according to a monthly analysis of global temperatures by scientists at NASA's Goddard Institute for Space Studies (GISS) in New York. Last month was 0.88 degrees Celsius warmer than the mean May temperature from 1951-1980. The two top May temperature anomalies have occurred during the past two years. 2016 was the hottest on record, at 0.93 degrees Celsius warmer than the May mean temperature. The GISTEMP monthly temperature anomalies superimposed on a 1980-2015 mean seasonal cycle. May 2017's temperature was 0.05 degrees Celsius cooler than May 2016. It was just 0.01 degrees Celsius warmer than the third warmest May, which occurred in 2014. The modern global temperature record begins around 1880 because previous observations didn't cover enough of the planet. Monthly analyses are sometimes updated when additional data becomes available, and the results are subject to change. For more information on NASA GISS's monthly temperature analysis, visit data.giss.nasa.gov/gistemp. For more information about NASA GISS, visit www.giss.nasa.gov.